I've heard from several people recently who have either launched a new book—Janie Wilkins (Let's Roll: Granma Janie Rocks), or are in the process of launching—Mike Walsh (Ocean Beach) and Perry Smith (If God Isn't Merciful We're All Screwed). I'm sure there are others I haven't heard from, and if you'll let me know I'll give you props in the next blog post. The point is now is the best time to join Janie, Mike and Perry as published authors—or at least set a deadline goal for publication. To help you get motivated, consider attending one or more of NE Florida's FWA chapter meetings. The River City Writers will gather on Tuesday, September 8 at 7:00 p.m. at the SE Branch Library. Contact Gregg Golson for meeting details. If you dig researching your books, you'll love what Environmental Crimes Detective Robert Dews has to say about "Finding Magnolia Lake State Park," Wednesday, September 15 at the Clay County Writers meeting. Working with the Clay County Sheriff's Office, Mr. Dews became interested in researching the history of this little-known county park, one of several statewide segregated for African-Americans. He says "I enjoy discovering and learning about the past," and you'll enjoy this meeting at the Orange Park Library starting at 6:15 p.m. on the 15th. Join Nassau County's Writers by the Sea, Thursday, September 16, 6:30 p.m. at the Fernandina Beach Library. Nadine Vaughan-Williams has more information. Get to know your Kindle at the Saturday, September 19 meeting of Ancient City Writers, 10:15 a.m. at St. Augustine's Main Library. Pat Gaydos, a Kindle workshop teacher, will show us how to use the many Kindle apps to help us write, edit and research better. Pat will do an extensive show-and-tell in her program titled, "The Kindle and the Writer." Maria Geraci writes contemporary romance and women's fiction—and she writes fast. Having more product on the bookshelves is a definite advantage, and she'll share her secrets to "Writing Faster, Writing Better" at this month's meeting of the Ponte Vedra Writers, Saturday, September 26, 10:30 a.m. at thePonte Vedra Library. Reduced pricing for the FWA Conference ends on September 13, so now is a good time to register for what promises to be an excellent conference, October 15 - 18 at the Hilton Orlando in Altamonte Springs. Information and registration info can be found here. And don't forget the the Florida Writers Foundation Celebrity Workshop on Thursday, October 15 with award-winning thriller writer John Gilstrap. John's topic is "Adrenaline Rush: How to Write Suspense Fiction." The Florida Heritage Book Festival Writers Conference kicks off on Thursday, September 24 with critique workshops led by Elizabeth Sims and Sohrab Homi Fracis. Friday's workshop schedule includes a wide range of workshops by professionals, including literary agents Jeff and Deborah Herman, a keynote luncheon with Robert Macomber, and a post conference reception. Click here for more information and registration. There still may be time to become a vendor in the FH Book Fest's Saturday Marketplace. Check it out here. Florida Sisters in Crime welcomes Del Kiernan-Lewis. Saturday, September 5, 10:15 a.m. at the SE Branch Library. Del will talk about how to "Boost Your Creativity." Novelist, short story writer and creative writing professor John Dufresne returns to the First Coast on Saturday, October 3 for a full day seminar on "Writing the Novel" at Flagler College. Early bird pricing has been extended to September 15. More details and registration here. Frances Keiser and Jane Wood present "How to Start a Self-Publishing Company," Tuesday, October 13, 6:00 p.m. at UNF as part of the colleges Continuing Education program. More info here. Steve Berry has been named the Honorary Chair of the 2016 Amelia Island Book Festival, February 18 - 20. They'll host a murder mystery gourmet dinner on Saturday, October 24. Check it out. Fans of bestselling novelist Charles Martin can hear him talk about his latest bestseller, Water from My Heart, Monday, September 21, 6:30 p.m. at the Ponte Vedra Library's Book Talk Cafe program. It's free and open to the public. Jennifer Ashley is a prolific romance writer with 83 novels and novellas in print. She'll be the featured guest author at the First Coast Romance Writers meeting, Saturday, October 12, at the Jacksonville West Regional Library on Chaffee Road. Jennifer will present two workshops, the first at 11:00 a.m., "Being a Hybrid Writer in Today's Marketplace," the second at noon is on "Building a Series." The Ancient City Romance Writers hold its annual conference, "Dream Up a Story," September 25-26 at the Hampton Inn, St. Augustine Beach. Click here for details. On a personal note, I want to thank Dianne Ell, the longtime Ancient City Writers chapter co-leader for her many years of service to FWA and writers in our community. Dianne and her family have moved to SW Florida where she plans to devote more time to her writing. The group is in good hands with Judy Weber, Nancy Quatrano and others in charge, but I know you join me in wishing Dianne well in her new home. Since I began this post by touting new book launches, I'll indulge in a little BSP (Blatant Self Promotion). 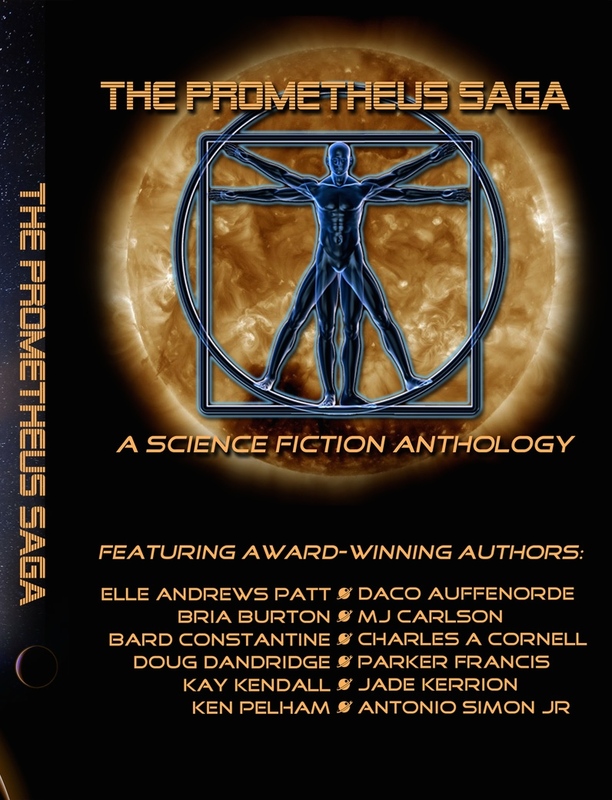 The Prometheus Saga was a project by 12 award-winning authors, including my alter ego, Parker Francis. Four of us are in the running as RPLA finalists, including one for my short story, "The Strange Case of Lord Byron's Lover." Each of us wrote stories based on a single SF premise, and published them digitally as individual short stories. On September 20 the print edition of the anthology containing all the stories in one collection will become available. And shortly after that we'll launch the anthology as an ebook. 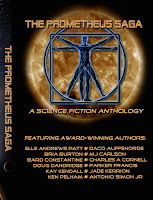 Look for The Prometheus Saga coming soon. As it turns out, September is a month overflowing with writerly events. Let's see how the rest of the fall turns out. other than Arthur Ashe. 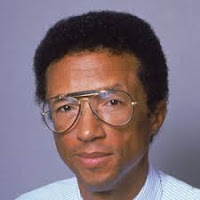 I had the honor to drive the tennis star to the airport afterwards, having been warned that Mr. Ashe wasn't much of a conversationalist. Ashe kept busy in the back seat reading through a stack of papers he retrieved from his briefcase, looking up on occasion to see where were —which was running late for his flight. At one point I took a wrong turn and had to double back. After not saying a word for thirty minutes, Ashe finally spoke up, asking me, "Do you know where you're going?" This is a question I often ask myself these days as I do periodic assessments of my progress as a writer and member of the human race. I'm not sure I'm ever happy with the answer, but it's still a good question to ask ourselves from time to time. If you don't like where you're going, there's always time to change directions. Which we'll do now as we review what's in store for our FWA meetings this month. The River City Writers meet on the second Tuesday of the month, August 11, at 7:00 p.m. in Room D of the SE Branch Library. Group Leader Gregg Golson will speak on the important topic of revision, "How I Polish My Manuscript." Backstory is on the menu at the Ancient City Writers chapter, Saturday, August 15. They meet at 10:00 a.m. at St. Augustine's Main Library, US1 and San Carlos, to hear from Nancy Quatrano discuss "The Scoop on Backstory: 10 Tips to Develop and Use it More Effectively." Nancy is a content editor and writer who will tell us how the correct use of backstory can boost your characters from average to riveting. The Clay County Writers meet on Wednesday, August 19 at the Orange Park Library at 6:15 p.m. Contact Maureen Jung for more details. Writers by the Sea of Fernandina Beach return to their summer meeting venue of the newly refurbished Fernandina Beach Library on Thursday, August 20 at 6:30 p.m. Members of the Playwrite Group will give a presentation called "Conversations with a Script." Group leader Nadine Vaughan-Williams has more information. Central Florida author Jeanne Moon Farmer has constructed a life with many accomplishments, including 35 years as a teacher, grant writer, and editor—not to mention her three novels and one nonfiction book. Jeanne steps on the stage at the Ponte Vedra Writers meeting, Saturday, August 22 to talk about what she's learned in "This Writing Life." The theme of her talk is "How to do what you love and love what you do." My thanks to Kimberly Smith for filling in for me at last month's meeting, but I'll be there to greet you on the 22nd at the Ponte Vedra Library at 10:30 a.m. The coffee will be hot and waiting to be poured. FWA affiliate, the First Coast Christian Writers, meet each Thursday at 6:45 p.m. at the Webb-Wesconett Library. The Florida Authors & Publishers Association Conference is this coming weekend, August 7 - 8 at the Hilton Orlando in Lake Buena Vista. The Florida Heritage Book Festival kicks off on Thursday, September 24 with the Writers Conference starting with a day of critique workshops. Friday presenters include Elizabeth Sims, Mark Powell, Darlyn Finch Kuhn, Jane Wood, Harrison Scott Key, literary agents Jeff and Deborah Herman and a luncheon keynote by Robert Macomber. Read more and register by clicking here. One of the benefits of joining FWA is adding to your publishing credits by submitting an article for FWA's magazine, The Florida Writer. If you're already a member, you should have received the August issue. It's crammed with outstanding articles and features, including a summary of the results of the mini-conference survey. One of the popular location choices for 2016 was St. Augustine, so on Saturday, February 27, FWA will present a one-day mini-conference in the Ancient City. It will be held at the Ringhaver Student Center at Flagler College. Watch for more details as they develop. In the meantime, if you haven't registered for the annual FWA Conference, now is as good a time as any. The conference, October 15 - 18, has moved to the Hilton Orlando-Altamonte Springs. The conference offers a wealth of workshops and more sessions than ever. Agents, acquisition editors and film producers will be on hand to hear your latest project. Check it out here. The Women's Industry Network has extended an invitation to local authors to participate in an Author's Showcase on Friday, August 7 at Suite at St. Johns Town Center. There is no fee to participate, and authors will have the opportunity to showcase and sell their books. Tables and chairs are provided. If interested, contact Myesha Jones at myesha.jones7@gmail.com for a registration form. Time to sign off, but I wish I'd remembered J.R.R. Tolkien's wise words from The Fellowship of the Ring when Arthur Ashe asked me if I knew where I was going. The master of the Ring said, "Not all who wander are lost." That makes me feel much better.